Welcome to massagical.com: adding the magical into massage — wellness in Hawaii. 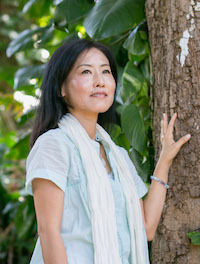 My name is Masako and I am a professional massage therapist (MAT#7491)since 2003. I have been living in Hawaii for 16 years but originally from Japan. I have worked at several spas and clinics on Oahu, including AVEDA Salon in Honolulu, and at The Kahala Mandarin Hotel. I use high quality medical grade essential oils (Youngliving) with each massages. They help you to release tension, emotion, feelings and thoughts easily and naturally. I’m also an energy healing practitioner, so you may relax very deep and feel so happy after my massage. I work with Body, Mind and Spirit. I visit your hotel in Waikiki or Vacation rental houses in Honolulu. Hours 9:30am-4pm and 6pm-9pm on weekdays, 3pm-9pm on weekends. Please email or call for reservations. Please ask for kamaaina rate if you are hawaii resident. I can visit houses in Honolulu. This is a on-going class with wonderful aroma and guided meditation. You lease all your tension, emotion and thoughts and just relax. Find your nature inside of you. Every Thursday 7pm-8pm in Manoa. Seats are limited. Please call or email for reservation and direction.